Earlier in the day, a rescue operation started to extract a Thai youth football team trapped in the massive Tham Luang cave system in Thailand, Reuters reported. "Four boys have reached chamber three and will walk out of the cave shortly," Lieutenant-General Kongcheep Tantrawanit said, referring to the area where rescue workers had set up a base. Earlier it had been announced that two boys from the trapped soccer team had been rescued from the cave. The boys had to traverse more than four kilometers to get to the exit of the cave, according to Khaosod paper citing officials. "Two kids are out. They are currently at the field hospital near the cave," said Tossathep Boonthong, chief of Chiang Rai's health department and part of the rescue team. 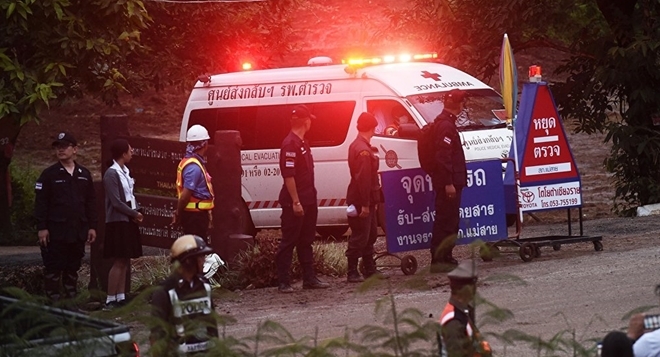 Two ambulances were seen leaving the cave in northern Thailand hours after the rescue operation began. Thai media reported Saturday that a group of international divers was preparing an emergency rescue plan to guide the 12 boys and their football coach out of the waterlogged cave in which they have been trapped for more than two weeks. The head of the rescue mission Narongsak Osottanakorn said Sunday "Today is the D-day. The boys are ready to face any challenges," AFP reported. Rescuers reportedly began the mission at 10a.m. local time (03:00 GMT) and the extraction of the trapped soccer team and their coach would take many hours before the first boy would emerge from the flooded cave, Reuters reported, citing Narongsak Osottanakorn. The boys, aged 11-16, and their 25-year-old coach from the Thai youth soccer team "Wild Boar" had entered the massive cave network in northern Thailand when it was still dry, but heavy rainfall soon flooded the exit tunnel, stranding them in a chamber, miles inside the system.